20 years ago newspapers were thriving businesses. They set the political agenda, shaped public opinion and uncovered large scandals. They also made lots of money. Most publishing houses had large headquarters placed in the most expensive parts of town as monuments to their fortune. From a business point they were in an enviable position. They were largely the gatekeepers between information and the public. If you wanted information you had to buy a newspaper. Gatekeepers typically make lots of money because they operate in a monopoly-like environment. If you want something you have to get it from the gatekeeper. Record labels used to be gatekeepers for music – if you wanted to listen to music you had to buy one of their CD’s. Hollywood studios used to be gatekeepers for movies – if you wanted to watch a movie they decided when it would be released in you country, when it would be on television and when you could rent it in blockbusters. They all made lots of money. Newspapers used to be gatekeepers for news. In a world without Internet this gave them a distinct business advantage. They had access to millions of readers. 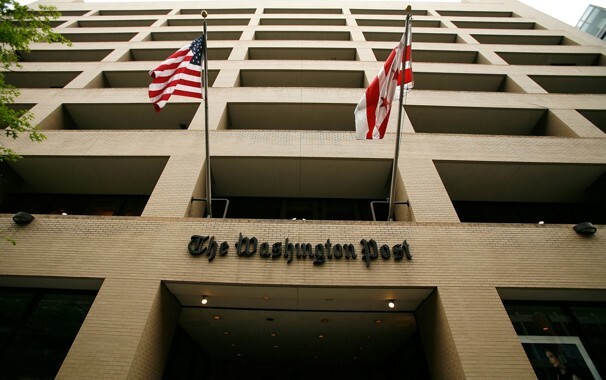 In the newspaper industry it’s no secret that actually producing news is a loss leader for the business that can be generated through the access to a large loyal audience that trusts the brand of the newspaper. A newspaper with only news can’t generate enough income to be sustainable. But that didn’t matter because seen from an business perspective news was the vehicle that allowed newspapers to bring their other business model to market. If you wanted to sell a house you paid the newspaper to be included in the homes section. If you wanted to fill a position in your company you paid the newspaper for an ad in the jobs section. On top of this came the normal ads. They made lots of money. The sunday papers were the size of phonebooks, filled with expensive ads, job listings and pictures of real estate for sale. They also wielded some serious political power since they controlled the flow of information to the public. 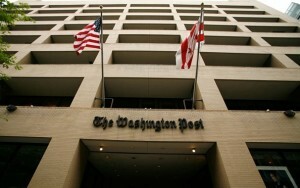 Washington Post headquarters – now it’s for sale. Then the Internet came along and ruined it all. With the rise of the Internet the newspapers gatekeeper role diminished. Slowly web-based services crept in and ate the newspapers lunch. Monster, linkedin and a load of other sites slowly ate the revenue generated from the job boards. Yahoo real estate, zillow and a large number of smaller sites stole the income from the real estate listings. Craigslist stole the classifieds. On and on it went. A million smaller specialised companies eating away at the newspapers economic foundation. The sunday paper was slowly reduced from a cashcow the size of a phonebook to a trickle of pennies from a few loyal customers who still thought that a job posting in the New York Times was a pretty good deal. This started happening 15 years ago, without the newspapers taking notice. Or at least it appears that way since none of them put serious effort into developing competing services. News was never the sole revenue driver for newspapers. Ads, classifieds, job postings and real estate postings made up a substantial amount of the revenue. Those are mostly gone. News is abundant and free. You can always find your news for free on the Internet. This means that the incentive to pay for your news is dwindling. Very few online publications can generate substantial revenue from online content, mostly in the financial press. Competitors have taken over the lucrative income models such as job postings with dedicated sites that do one thing and do it well. Not necessarily, but they have a rough road ahead. And they need to start moving now if they want to be in business 10 years from now. 1) It’s a structural change, and the old days won’t come back. Like so many other industries the Internet has disrupted the whole business model and stripped the industry of its gatekeeper role, and thus its income model. This won’t change. 2) Nobody has the obvious true answer. So what should a newspaper do to survive? First, look at what unique advantages it has. Brand value. Most newspapers have a brand that many online businesses would kill for. Who do you trust the most? New York Times or Instagram? Brand value is a key metric for driving sales. An audience. A newspaper typically has a large audience that it connects to on a daily basis. Journalists! The people whose job it is to create interesting and engaging stories that depict the world in which we live. A lot of them do it very well. So newspapers definitely have some value, what they don’t have is a way of capitalising it. In a way newspapers are like startups. In the words of Silicon Valley legend Steve Blank “a startup is an organization formed to search for a repeatable and scalable business model.” The main difference is that newspapers are way ahead of startups in that they already have brand, audience, money and a dedicated staff. All they need is the business model. So how do startups find a repeatable and scalable business model? They try a lot of different things and see what sticks. It’s the exception rather than the rule that what a successful startup ends up making money on is what was envisioned in the original business plan. Paypal started as a digital wallet for PDA’s, Hotmail started as an online database business. Google didn’t have any idea how they would eventually make money when they started. Get an idea and create the simplest implementation that could possibly work. Get it out to customers as soon as possible. In startup speak this is called the minimum viable product. The point is not to have a perfect product but to find out whether it’s something people will pay for. If it shows promise you can always improve it. Continuous deployment: Put your minimum viable product out there and test it. Tweak it, make it better, change it a bit and see what happens. Do this continuously until it works. successful startups often deploy new tweaks multiple times a week. Actionable metrics: If you don’t have metrics you don’t know whether a deployment is a success or not. Metrics can be users, acquisitions. readers or money in the bank. Pivot. If your minimum viable product doesn’t work, even after tweaking and testing, drop it and think of something else. Repeat and rinse until you have a business model that works. Newspapers should copy this model. If 2 guys in a garage can make it work so can a news organisation that already has a brand, an audience, journalists and a solid infrastructure. Why the Euro will ultimately fail.